Today is the debut performance of the first Leading Lady of 2018: our January Leading Lady, Andrea Shell! Andrea's projects are full of bright bold color, gorgeous coloring, a clean aesthetic and some smart little touches that make them stand out! She really caught my interest with her challenge entries last year like this clever dream catcher card HERE. I am really excited to see what Andrea will be creating this month as she takes us on an adventure of her own design on Saturdays in January on the w&w blog. Please give Andrea a big round of applause to welcome her as she steps onto the stage for her first performance as our January Leading Lady! Hello! It's Andrea from Blissfully Scrappy taking over the Winnie & Walter blog today. I am beyond thrilled that Shay asked me to be the January Leading Lady (and, yes, more than a little surprised)! When I was contemplating a theme for my posts, a line from The Sound of Music kept playing in my head: "These are a few of my favorite things." Sharing some of my favorite (papercrafting) things seemed like the perfect theme! For my first post, I just had to go with what's at the top of my list - adorable critter stamps! 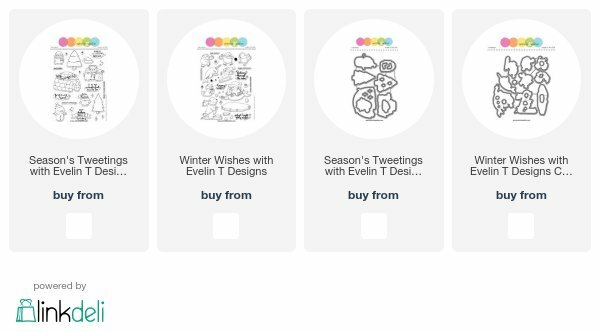 Winnie & Walter has some of the cutest critters on the market, and I completely fell in love with the animals from their Winter Wishes with Evelin T Designs set, released in November. Using them was a total no-brainer (especially with the Winter Olympics a month away)! I stamped all of my images with Memento Tuxedo Black ink, colored them with Copics, and die-cut them with the coordinating dies. To help fill out the scene for my first card, I also stamped and colored some trees from the Season's Tweetings with Evelin T Designs set. I ink-blended the background with Salty Ocean and Tumbled Glass distress inks and flicked on some water droplets. With my scissors I cut a snowy hill and die-cut the pond from it, adding Tumbled Glass to the edges of the opening. After adhering the sky to a white card, I added my snowy hill, inlaying the colored pond and tucking the trees behind the hill. I stamped a sentiment from Season's Tweetings with Evelin T Designs with Versafine Onyx Black ink before adhering the little birds, popping up the one in the foreground with foam tape. I added some highlights with a white gel pen and brushed some Spectrum Noir Clear Sparkle overlay onto the pond. The background on my second card was created with Shaded Lilac, Spun Sugar and Scattered Straw distress inks. I silver heat-embossed a sentiment from Winter Wishes with Evelin T Designs and adhered the panel to a white card. I die-cut two snowy hills and blended Tumbled Glass onto the back hill for shading. Once I had adhered the hills together, however, I decided I wanted darker shading and added more with my Copic markers. The foreground hill was popped up with foam tape, as was the bottom puffin. I added some details with a white gel pen and some sparkle with Spectrum Noir Clear Sparkle Overlay. A scattering of clear sequins adds the finishing touch. Thanks for stopping by! If you'd like an opportunity to win a $30 W&W gift certificate which Shay has so generously provided, please leave a comment on the corresponding posts on my blog by midnight CST on January 31st. Congrats on being January's Leading Lady! Your coloring is incredible! Such sweet critters and adorable scenes you made for them. Fabulous coloring!!! Congratulations on being the Leading Lady this month. Looking fwd to seeing your work each week!!! I have been following Andrew's work on FB and totally in love with it ! Wonderful cards shared today with lovely colouring! Congrats to Andrea! Her cards are fabulous! Looking forward to her Leading Lady posts this month! Cute winter scene with fabulous coloring. Oh these cards are too cute!! Beautiful coloring and congratulations!!!! Big fan of Andrea's artwork! So happy to see her as Leading Lady! Absolutely love both these super cute cards! Congrats, Andrea. These are the cutest cards. Love the little blue ice rink on the first one. So clever! Congrats Andrea! Such beautiful coloring with winter feel on your creations, awesome! Congratulations!!! Your coloring is beautiful! Both your cards are beautifully coloured with fun winter scenes. Thanks for sharing your creativity. EEk!! Cute critters and winter sports are the best! I love your cards and gorgeous coloring technique. I can't wait to see what you share this month as leading lady. Congrats on being the January Leading Lady, Andrea!!! Love your sweet cards!!! Congratulations to Andrea. These cards are adorable. Congrats on being January’s Leading Lady, well deserved! These cards are so super cute and sweet, some of my favorite critter stamp sets!